Life is full of choices and selecting a new exterior siding for your home is no exception. There are numerous types of cladding available and each has advantageous features. If low-maintenance and durability are priorities, fiber cement or vinyl siding may top your list. Homeowners in western states might gravitate toward stucco for the value it could add to their houses. But what if you happen to be a traditionalist? Is there a wood siding option that lacks many of the veneer's well publicized problems? Eco-friendly -- LP SmartSide is made from small, fast-growing trees that are harvested from responsibly managed forests. Even better: just about every part of the tree is used during the manufacturing process. Durable -- LP's patented SmartGuard system is used during siding production to help deter damage from moisture and termites when the boards are on your home. DIY-friendly -- Unlike fiber cement, SmartSide can be cut with normal saw blades and secured with conventional nails and screws. The wood siding is also much lighter than fiber cement and less prone to breakage or cracking. Low-maintenance -- Because SmartSide is engineered wood siding, it has no knots that can fall out over time, It's also resistant to the warping and cupping that can be such a problem with traditional wood cladding. And to make painting easier, the siding is shipped already primed. Variety -- While SmartSide may not have the numerous style options available from many vinyl siding manufacturers, there are several profiles and widths from which to choose. The engineered wood can also be ordered in 16-foot lengths to reduce the number of unsightly vertical seams on the exterior walls of your home. 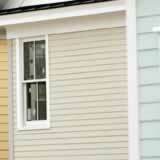 How does the engineered wood compare to vinyl siding in cost? MWP Supply Inc. in Madison, Va. quotes Mastic's Brentwood vinyl siding, a mid-range product, at about $89 per square. Their pricing for SmartSide's Precision Series is about $117 for the same quantity, and the Architectural Collection comes in a little higher at approximately $136 per square. If you like wood siding but not its problems, consider LP SmartSide products as an alternative.